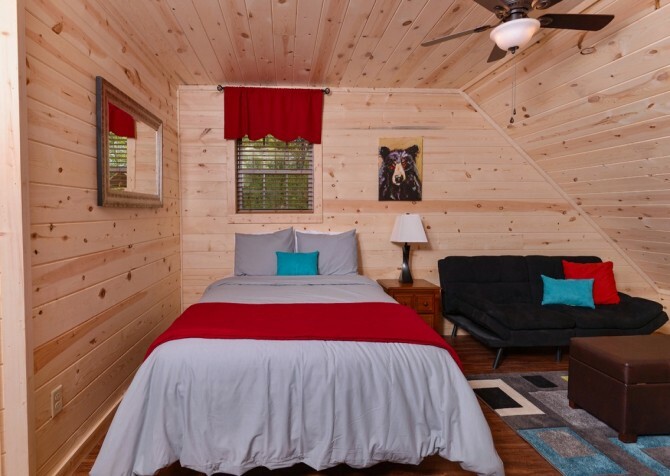 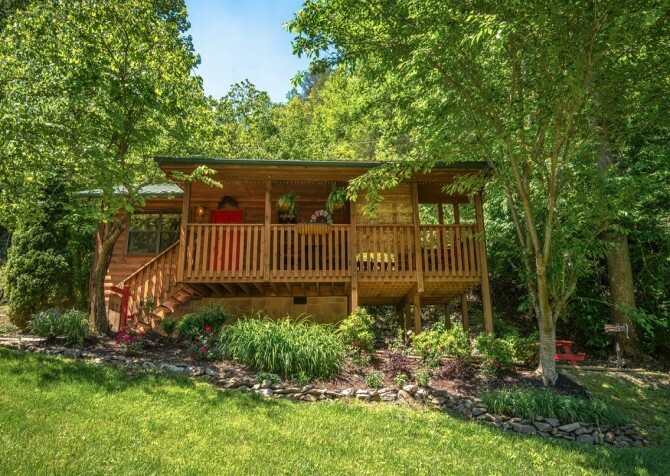 Clean, contemporary style blends with fun Smoky Mountain details in this bright, welcoming Pigeon Forge cabin almost equidistant from Pigeon Forge and Gatlinburg. 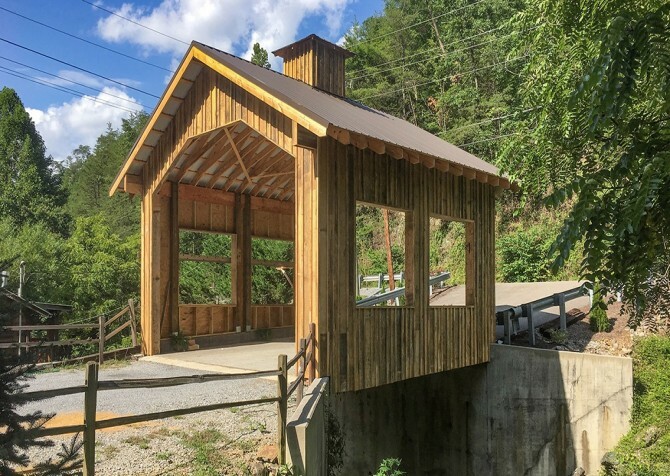 Finished in 2017, this beautiful new cabin is fresh and open, great for fun and relaxing getaways in the Great Smoky Mountains. Along the Right Path has 1-bedroom, a loft, and 2 bathrooms for a group of 8, so it’s perfectly suited for a family vacation or a small group getaway. Throughout the cabin, lots of conveniences make it feel like home. 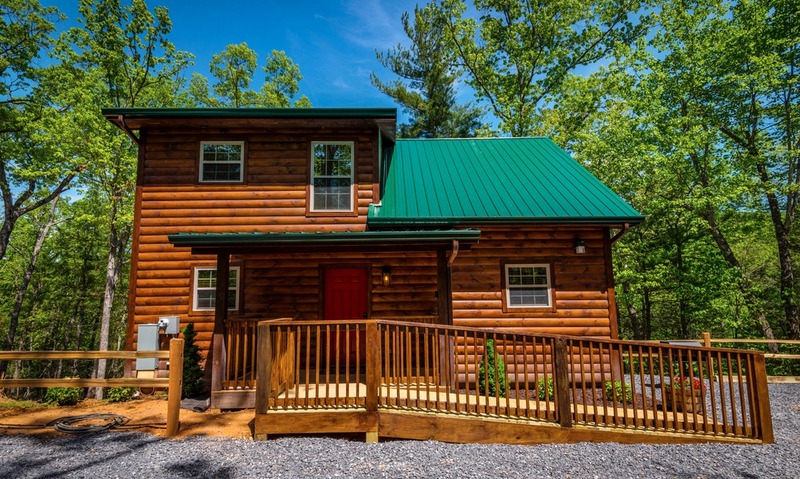 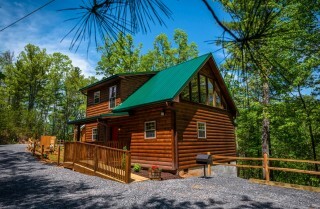 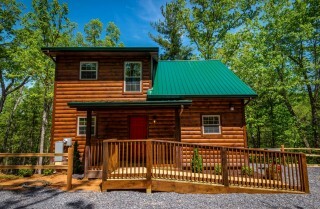 Stay connected with wireless internet, bring your favorite movies to watch on the big screen TV and Blu-ray player, have cookouts with the charcoal grill, enjoy homemade meals cooked in the cabin’s fully equipped kitchen, and relax with family and friends in the cozy living room. 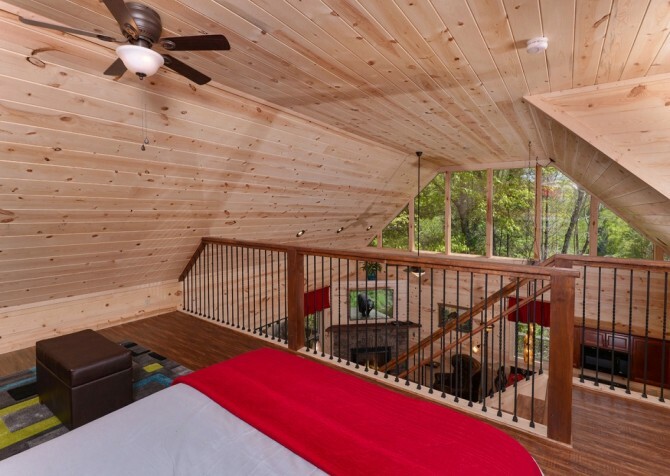 Each space has been designed to feel like home, while little peeks of the trees through the windows remind you that you’re peacefully tucked away in the mountains. 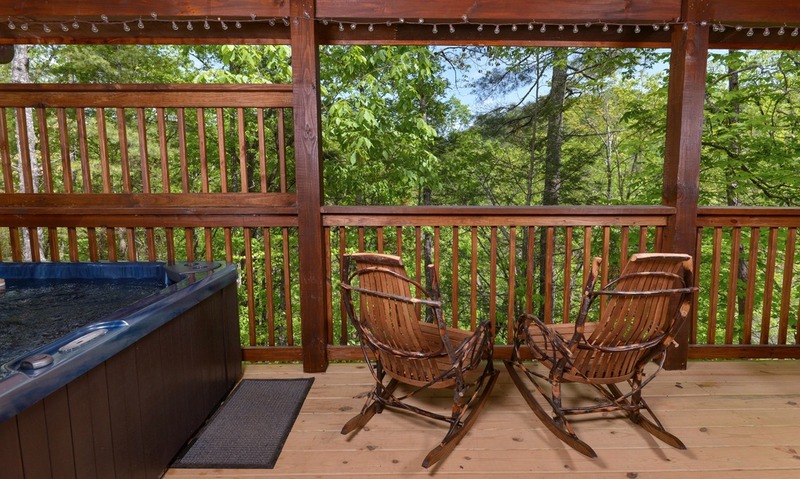 Outdoor areas expand your living space here, with a lovely covered porch with rocking chairs, a hot tub, and a dining table – all surrounded by the lush trees. 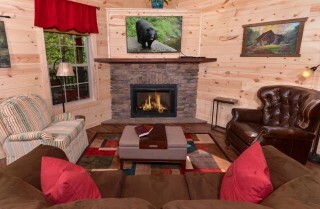 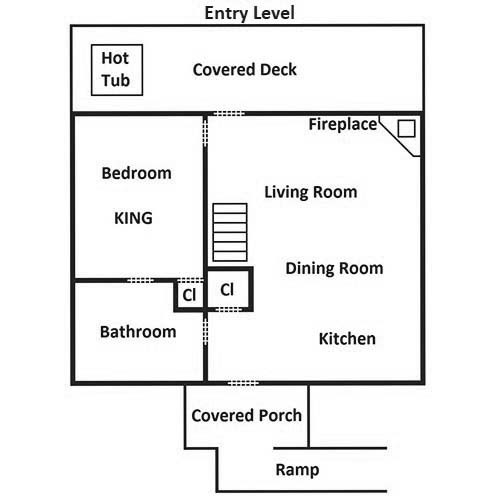 Little extras like access to a community fire pit, a ramp leading to the cabin and space in the main-floor bathroom for a wheelchair, and smart TVs make it an extra-special space. 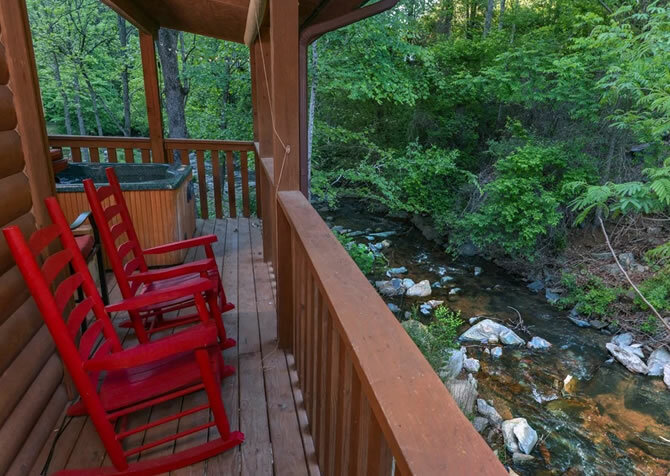 In the Beside the Still Waters community, it also offers several sister properties nearby. 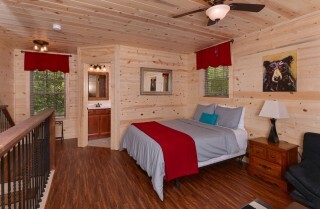 You can book one for an intimate getaway or book them all when you have a group that wants a little extra privacy! Within this serene community, also check out: Goodness and Mercy, My Cup Overflows, Comforts Me, Lacking for Nothing, In Green Pastures, and Restores My Soul. 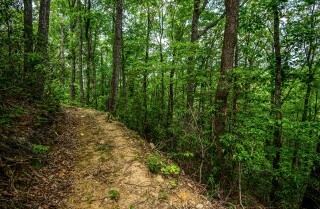 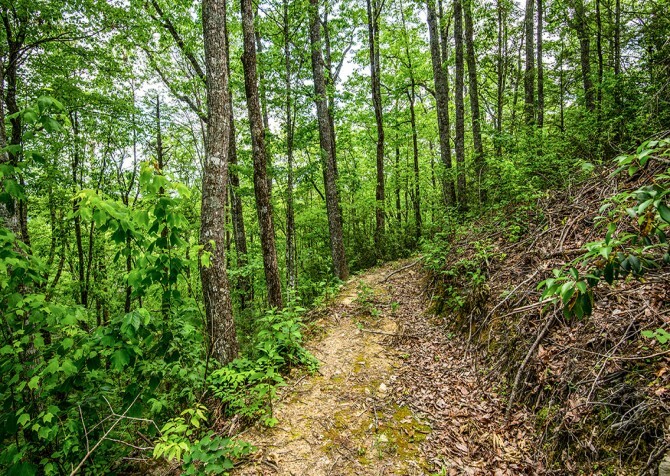 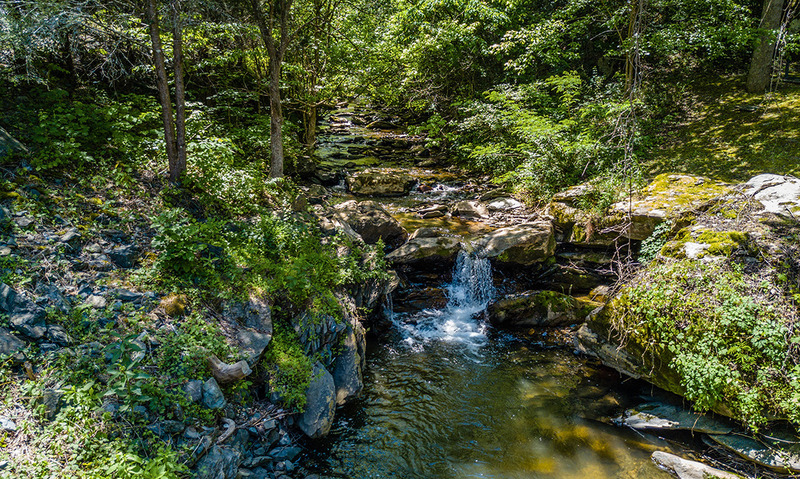 Along the Right Path is also perfectly located if you want to explore both Pigeon Forge and Gatlinburg. It’s almost equidistant to each mountain town, so you can spend days playing at Dollywood and shopping at the outlets in Pigeon Forge or strolling along the Parkway and checking out Ripley’s Aquarium of the Smokies in Gatlinburg. 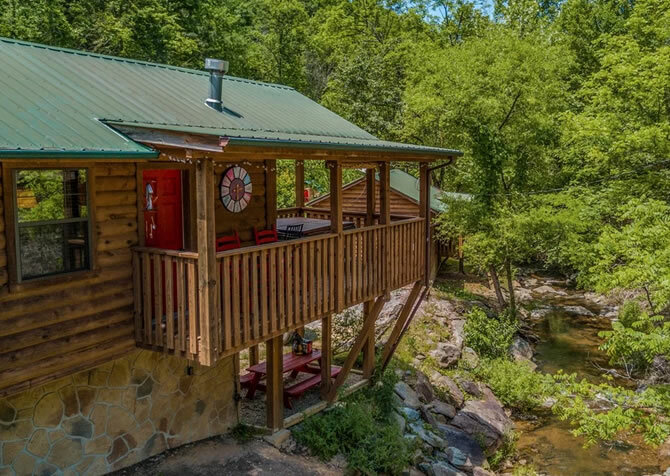 From steakhouses to quick bites, family-friendly attractions to distilleries, art galleries to go kart tracks, these two bustling cities offer a taste of fun for kids and adults of all ages. High ceilings, windows where the sunlight streams in, and an open floorplan leading to the kitchen…the living room of Along the Right Path is bright, cheery, and perfect for days spent relaxing, watching TV, and catching up with family and friends. 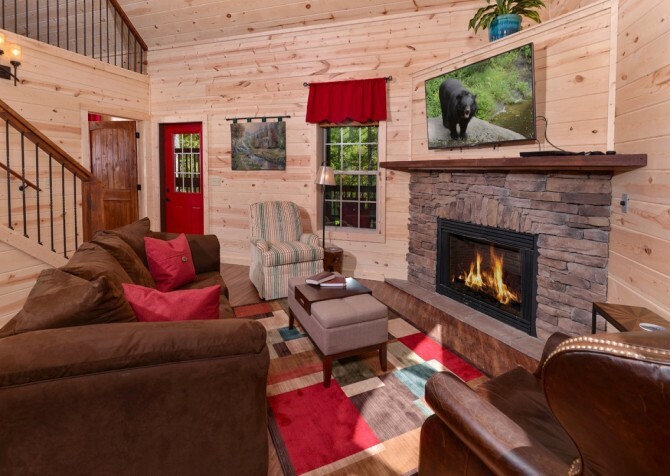 It’s outfitted with a comfy couch, along with 2 chairs – 1 upholstered, 1 wingback – a beautiful stone fireplace, and a 55-inch smart TV. 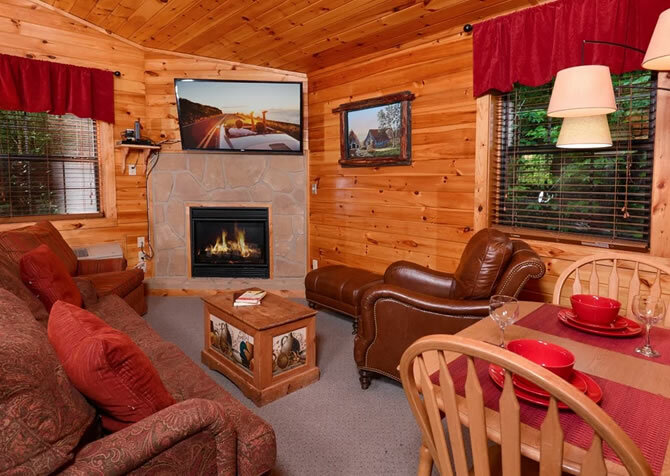 Hang out here to watch ball games, bring your favorite movies, or enjoy a drink and snack while you watch some late-night shows and unwind. 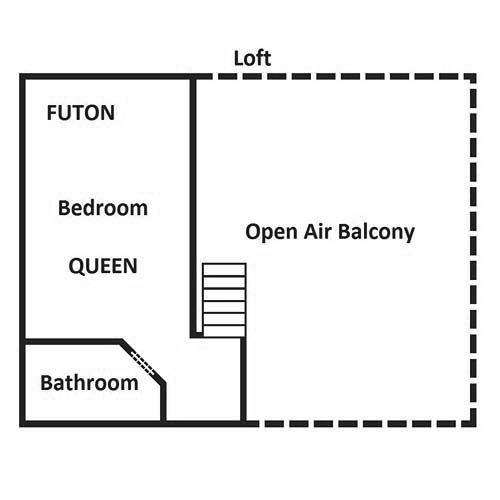 And because it’s open to the kitchen, it’s easy to grab a drink or make a quick bite to eat without missing a play or missing out on the conversation. 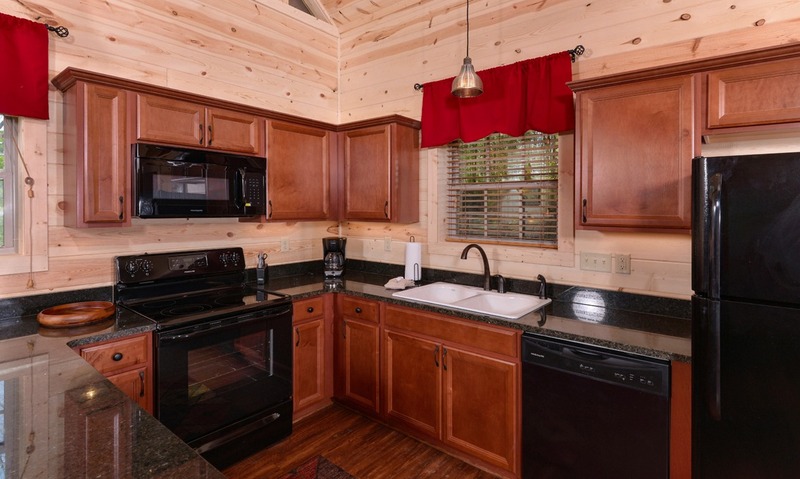 Mealtime is made easy at Along the Right Path, where a fully equipped kitchen offers the space and tools you need for whipping up snacks, getting drinks, and making homemade meals for the group. The breakfast bar has seating for 5, and the dark granite countertops pair perfectly with the rich wood cabinets. 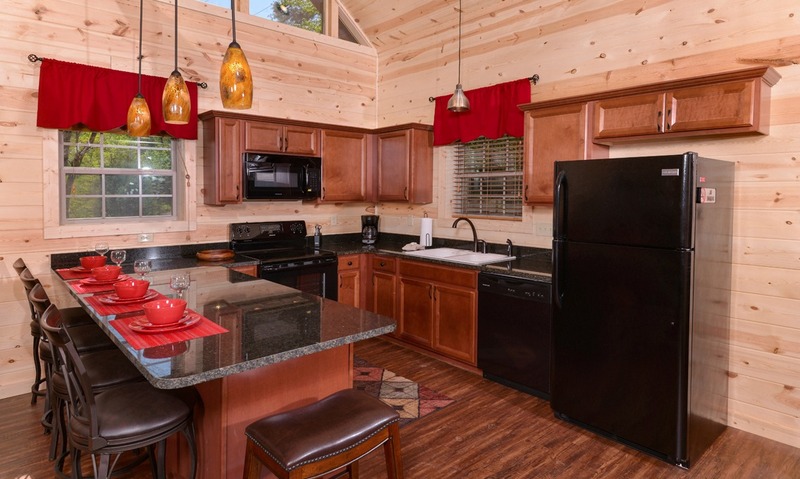 The space features a refrigerator, dishwasher, stove/oven, and built-in microwave, along with essentials like a coffeemaker, dishes and glassware, and pots and pans. Even if you’re not up for doing your own cooking, a full kitchen gives you the space to keep leftovers, bring back takeout, or order catering and set up a spread. 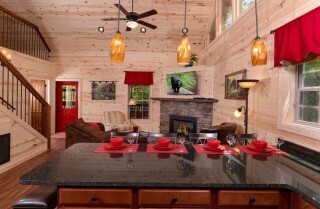 Chat with guests as you prepare meals, and then sit down at the bar for some time together. 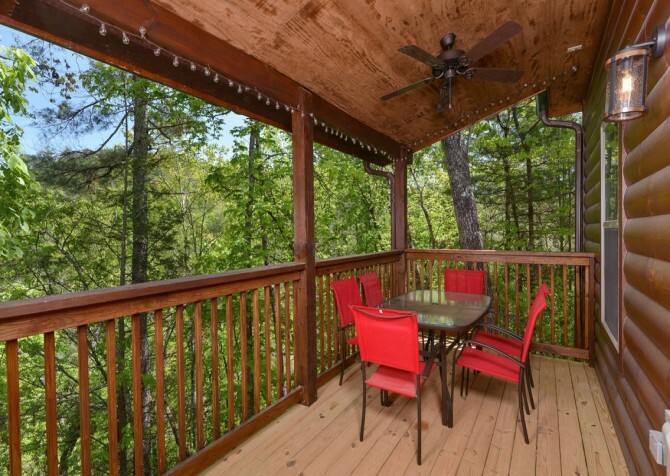 Or you can take your plates out onto the deck, where you can sit down at the 6-person dining table and enjoy wooded views and fresh air. 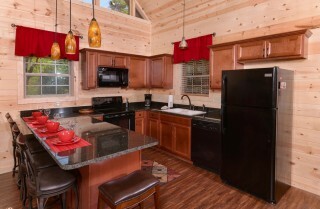 The kitchen even features a full radius for a wheelchair, so it’s easier to move around. 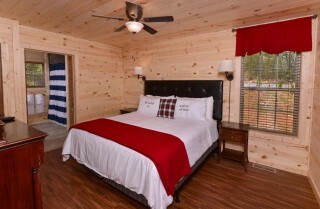 A retreat within a retreat, the bedroom of Along the Right Path is a soothing place to end the day. 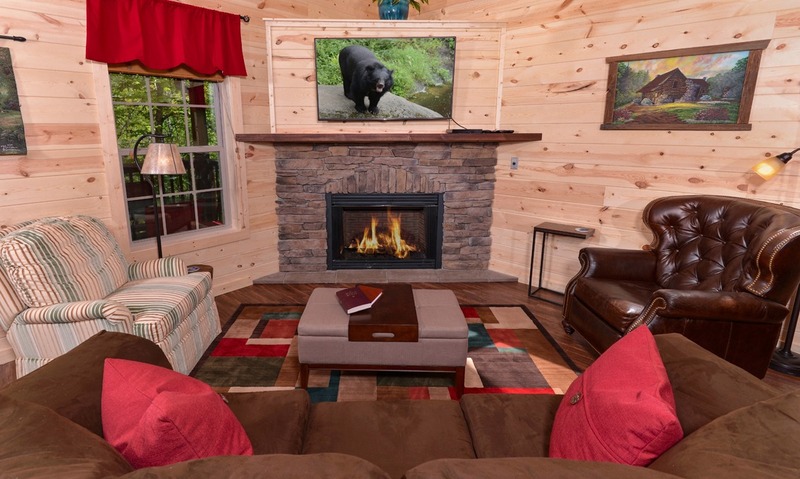 After hiking in the Great Smoky Mountains National Park or shopping and eating at The Island in Pigeon Forge, you can climb into the king-size bed and flip on the 48-inch smart TV. 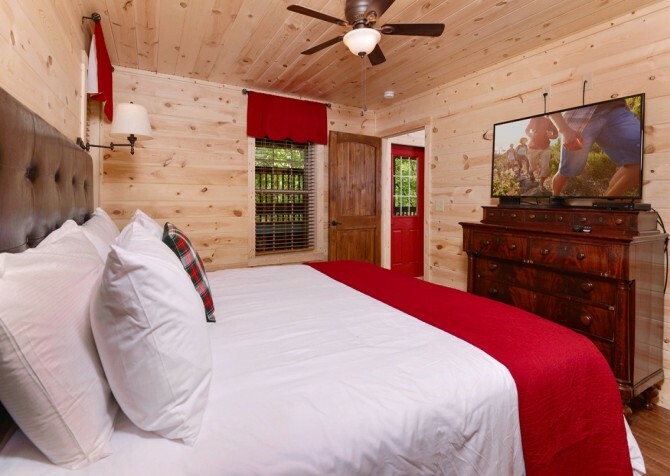 The room is simple but inviting, with an elegant headboard, nightstands and bedside lamps, and windows that frame tree-studded views. 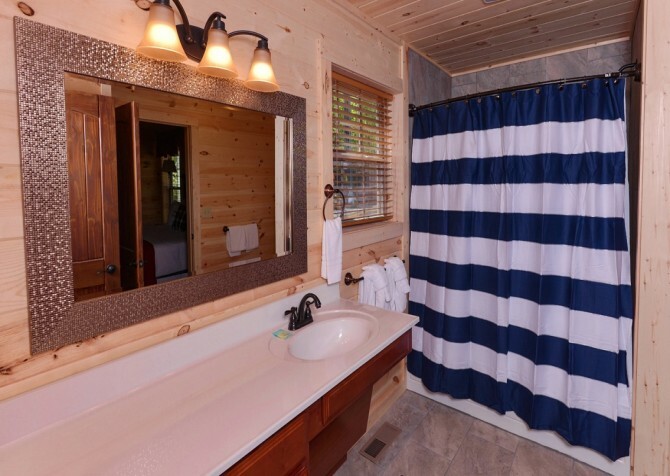 The bathroom is made for easier wheelchair accessibility (shower not handicap accessible), with a wider space by the toilet and room to roll up to the sink. The master bath here also boasts a jetted tub for relaxing soaks after long days. 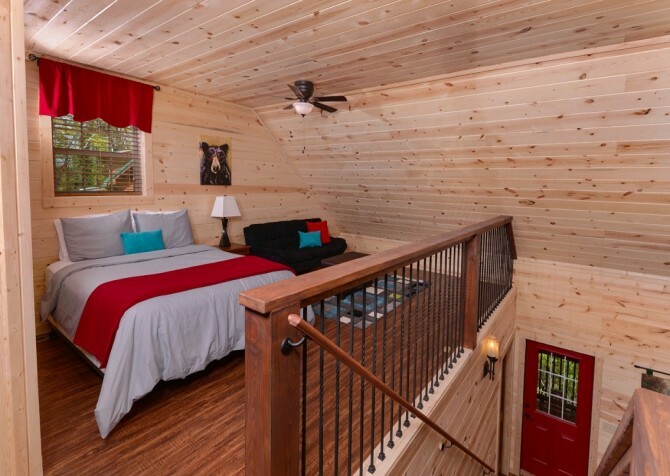 The loft in Along the Right Path provides extra sleeping space and features pops of bright colors and simple, clean lines. It’s furnished with a queen-size bed and a futon, so it’s perfectly set up for a small family or the kids. The second bathroom is also located here, giving each guest plenty of space to get ready. 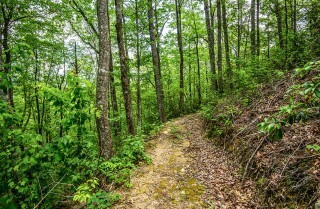 Along the Right Path is perched among the trees, offering peaceful days of tree-studded views and the wind blowing through the leaves. 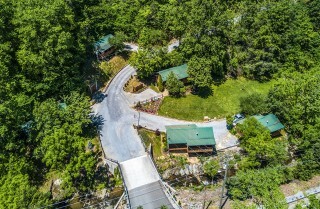 The gravel driveway has room to park a trailer, and a ramp leading from the parking area to the front door makes the cabin more accessible. There is a hiking area nearby, a community fire pit just down the hill, and a community storage area for rec items like horseshoes. 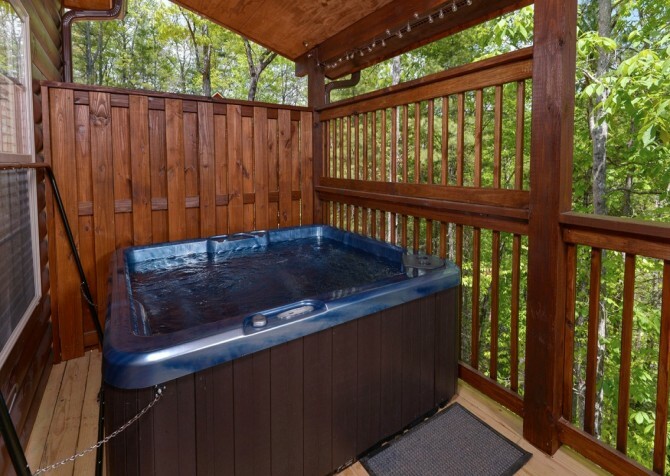 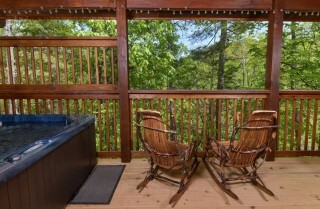 At the cabin, unwind on the deck as you enjoy wooded views. The covered deck features hanging lights, along with rustic rocking chairs where you can have a cup of coffee and relax. 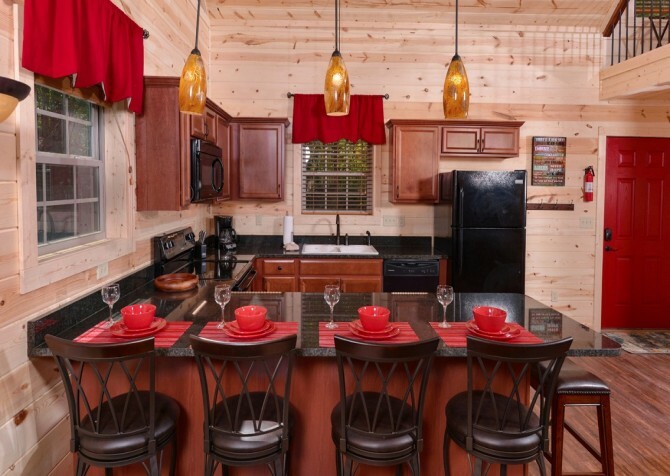 A dining table for 6 gives you a nice place to have an outdoor meal, and then you can climb into the 5-person hot tub to relax. With wireless internet in Along the Right Path, you can keep up with emails, get a little work done, or find out what events are happening during your stay by keeping up with our blog. We even post recipe ideas when you want to cook in the cabin or take advantage of the charcoal grill! If you need some extra sleeping space, the cabin has a futon and sleeper sofa. And don’t forget your favorite movies – Along the Right Path has a Blu-ray player for movie night. 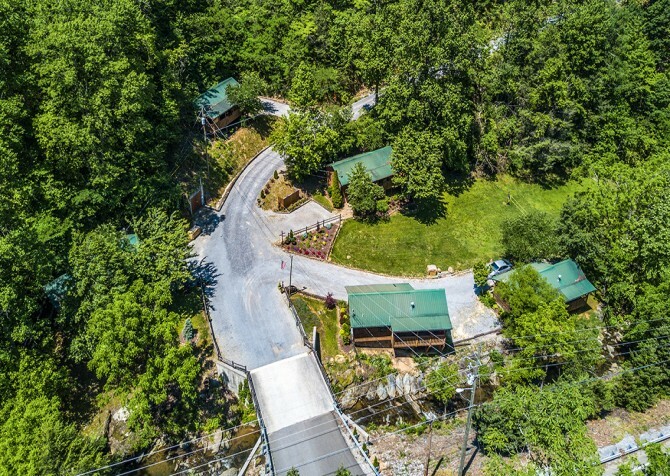 The Island is a full day of fun, with a ropes course, The Escape Game, the Great Smoky Mountain Wheel, celebrity-owned restaurants, the show fountain, Ole Smoky Moonshine, lots of shops, and more! Enjoy a hearty 4-course meal and some awesome entertainment during a night at Dolly Parton's Stampede. 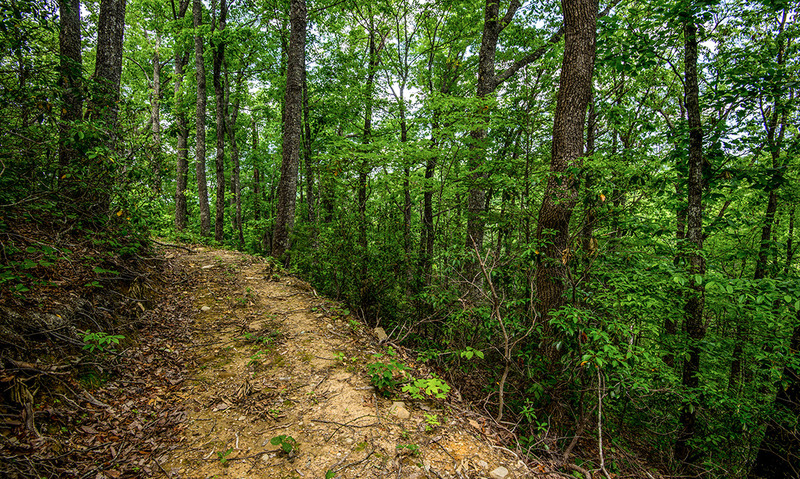 Talented performers in dazzling costumes will impress with their riding skills! 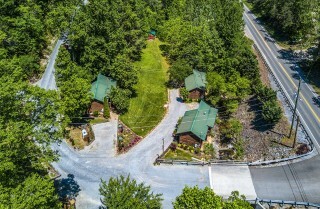 With indoor ice skating, skiing and snowboarding, the Alpine Slide, the Aerial Tramway, shops, an arcade, restaurants, and more, Ober Gatlinburg has a great blend of fun for all ages.